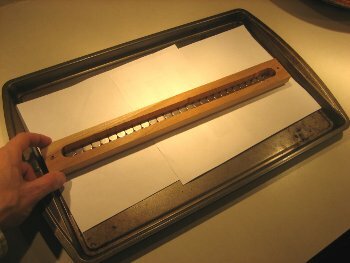 Constructing a Magnetic Knife Holder is a popular project using our neodymium magnets. In this article, we've built our own using simple construction methods. Find out more about what size magnets you need, how many, and much more. Materials include: Wood, Magnets, Glue/Adhesive and Screws. Tools include: Table saw, Router and Drill. That's what we used, but you might do it a different way. It all depends on your woodworking skills and the tools you have on hand. A knife block is a simple enough project that can be done with very different skill levels. 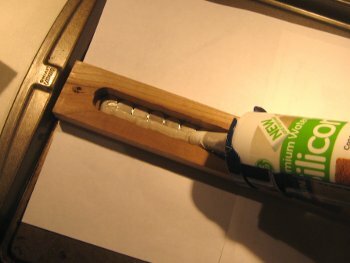 This article focuses more on the magnetic aspects of the project, skipping the woodworking tutorial. The pictures below outline the basic steps we followed to create our wood, magnetic knife holding block. 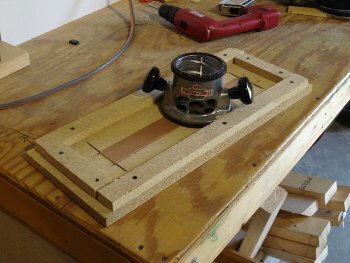 Cut a block of flat wood to size. Ours is 2" tall & 16" wide, from 3/4" thick cherry. In hindsight, 18" wide might be nicer. 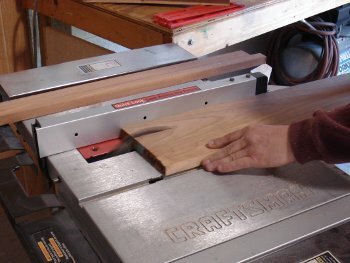 Create a fixture for cutting the groove in a nice, straight line. Cut with the router to make the groove. 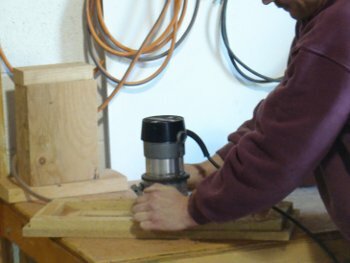 Set the depth properly to leave the desired thickness of wood. We left 1/16" thickness of remaining wood. All major cuts on the blocks are finished. A rounded edge all around was made with a router. Place the magnets in a row with alternating polarities. As you look at the magnets, the poles will be North, South, North, South, etc. The edges attract in this orientation, and don't repel each other. Use a steel sheet (a.k.a. baking pan) to help keep the magnets in place during assembly. While many different types of adhesives will work well, a silicone adhesive is used here. The nearly finished product, hung on the wall for testing. Still need to oil the wood and use nicer screws. How big should the magnets be? The thickness of the material between the magnets and the knife -- this is the most important factor! On the back side of the block, we cut a groove that left a wood thickness of about 1/16". A long row of D83 magnets were used, which have a nice feel. Thinner D82 magnets would also have worked well. An initial build with D84 magnets also worked, but seemed to pull a little too hard. The stronger the magnets, the more the knife will *snap* to the wood. We also didn't want to have to pull too hard when removing a knife. It all comes down to personal preference. 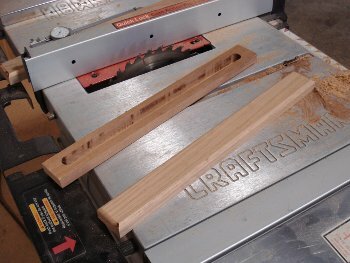 What if I have a different thickness of wood? Many folks email us about using thicker pieces of wood. You can certainly do this, but you'll need a much bigger magnet to get the same pull on the knife at the wood's surface. We've compiled this chart as a guideline for what size magnet you'll need. It's based on our own experience building this knife block, and what seems like a nice strength to us. Your ideal strength might be a little different than ours, but this should get you close. 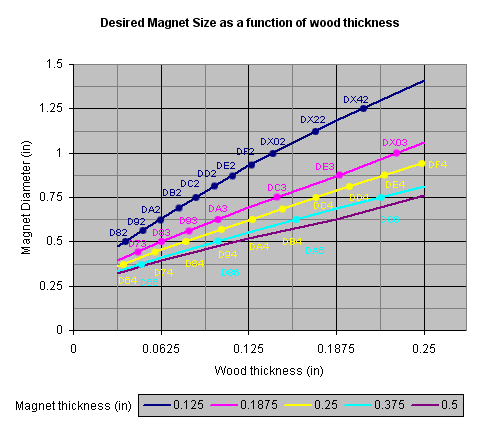 For example, our wood thickness (shown on the bottom, x axis of the graph) is 1/16" or 0.0625". For a magnet thickness of 3/16" (0.1875"), go straight up from 0.0625" until you hit the pink line (which is for all 3/16" thick disc magnets). It hits right at the D83, across from a diameter of 0.5". We could just as well used the slightly weaker D74, or the stronger D84 or D93. What about 1/8" (0.125") thick wood? From this chart, I start at the 0.125 wood thickness along the bottom of the chart. Move straight up until the line for the desired magnet thickness is reached. I like 1/4" thick, so I stop at the yellow line. Move left to find the required diameter, and hit 5/8" diameter. A DA4 magnet should work nicely. Of course, a D88 or DF2 would work too. DA4 is probably my first choice. How can I figure this out on my own? To compile this chart, we used our Magnet Calculator and a bunch of assumptions. The D83 worked well in our tests, and the Magnet Calculator figures that the D83 pulls with about 2.67lb to a steel plate that's 1/16" away. For a lot of reasons, that's not exactly the real pull force I would measure. The calculator assumes one magnet and a big steel plate. This knife holder has a series of alternating magnets attracting to thin, stainless steel knives of varying dimensions. It's apt to be completely wrong! It can be used to give an apples-to-apples comparison. For example, a thinner magnet with a bigger diameter (the DA2) pulls with about the same force to a steel plate at 1/16" distance as a D83, as indicated by the calculator. Therefore, it's probably a good assumption that a row of DA2 magnets will behave very similarly as the D83 magnets. What if I want to use block magnets? Yes, block magnets can work just as well. To compare the strengths, just compare the Pull Force, Case 1 strengths listed for a block to the disc magnets referred to in this article. For example, a B664 magnet has almost the same Pull Force listed as the D83. How can I be sure to get the right sized magnets the first time? It's always good advice to get a small number of different sized magnets, and experiment in your exact application. 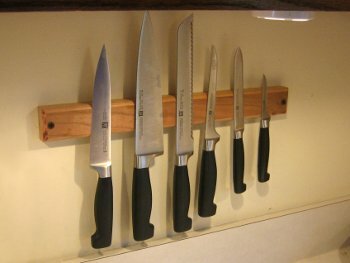 For knife holders, though, there is a trick. Remember: the strength depends very much on the distance between the magnets and the knife. You can use this fact to help make sure your first batch of magnets will work. When ordering, purchase magnets perhaps slightly thicker than what you think you need. 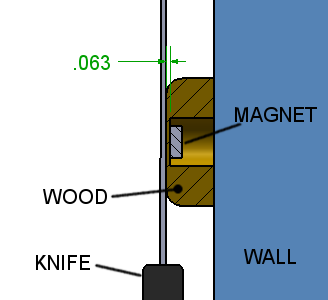 Then, when building, you can adjust the strength by adding or removing spacers between the magnet and the wood. If it's too strong, simply shim the magnets back further from the surface. A wood shim, or even a few layers of paper or card stock can make a big difference in the pull strength. You can adjust the strength quite a bit by changing this gap by small amounts. While your initial purchase may be slightly more expensive, you can be reasonably sure to find a working solution with your magnets. The choice of how to finish the wood is up to you. We chose not to mess with stains or polyurethanes, using oil to preserve the wood's natural beauty. While linseed, walnut, Danish and teak oils are popular wood finishes, we chose mineral oil. It is often recommended for cutting boards, which sounded very similar to us. It might not preserve as well as some other oils, but it's non-toxic and avoids nut-allergy issues. Mineral oil may need occasional re-application, though our knifeholder has withstood a few years of household use quite well. Avoid olive or other vegetable oils which can turn rancid over time. 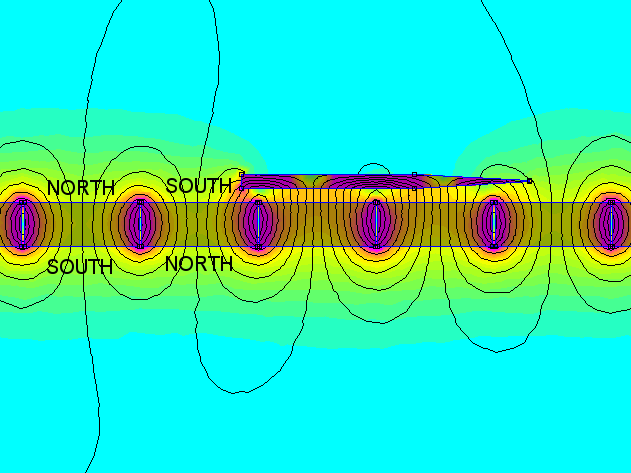 A 2D slice of our knife holder, showing the magnetic field. Magnets arranged in alternating poles, attracting towards each other, edge-to-edge. Construct one out of glass, acrylic or Lexan (polycarbonate). It might be cool to see the magnets! Many different methods of attaching the holder to the wall are possible, including magnets! Multiple rows of smaller magnets could be used, instead of one row of single magnets. While most of the kitchen knives we've encountered are ferromagnetic (attracted to magnets), there are some types of stainless steels that are not. Check and be sure that a magnet will stick to your favorite knife. Without the tools to cut a groove to a specific depth, a block could be constructed out of wood veneer. Use a thin piece of wood for the front surface, and glue the structure behind it. Some folks aren't interested in building a wood block, but still want to use neodymium magnets to hold their knives safe and clean. A simple, plastic-coated disc magnet like our RX034DCSPC-BLK can make for a great, one-knife solution.